In designing Windows 10 the Microsoft OS team had making computing very personal for the end user says Corporate Vice President, Operating Systems Group at Microsoft Joe Belfiore and as such are introducing like some of the other already cool features (if you are signed up for the Insiders Program you’ll know this) another cool new “personal computing” feature – Windows Hello and Microsoft Passport -. Windows Hello is a biometric authentication feature which can provide instant access to your Windows 10 devices. With Windows Hello, you’ll be able to just show your face, or touch your finger to new devices running Windows 10 and be immediately recognized without hassle. 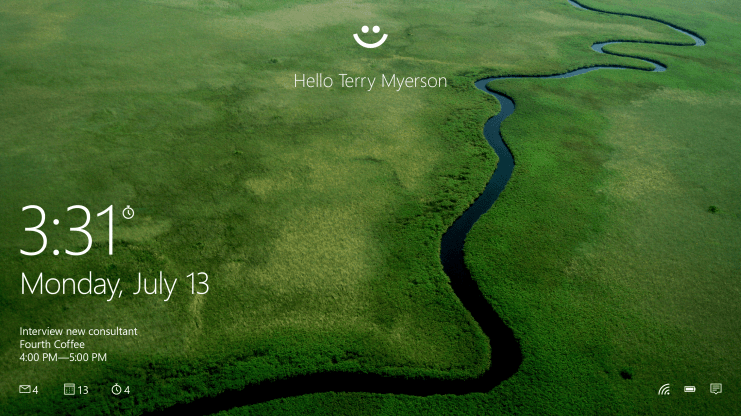 And not only is Windows Hello more convenient than typing a password—it’s more secure! Our system enables you to authenticate applications, enterprise content, and even certain online experiences without a password being stored on your device or in a network server at all. It uses a system support for biometric authentication using the face, iris or fingerprint with specialized hardware including fingerprint reader, illuminated IR sensor or other biometric sensors. If your device already has a fingerprint reader, you’ll be able to use Windows Hello to unlock that device, A picture of you or someone trying to impersonate you can’t be used to login. The cameras use infrared technology (like that of the Kinect technology) to identify your face or iris and can recognize you in a variety of lighting conditions. Microsoft Passport is a code name for a programming system that IT managers, software developers and website authors can use to provide a more secure way of letting you sign-in to their sites or apps. Instead of using a shared or shareable secret like a password, Windows 10 helps to securely authenticate to applications, websites and networks on your behalf—without sending up a password. Thus, there is no shared password stored on their servers for a hacker to potentially compromise. Microsoft passport gives you access to online content and apps without passwords but more securely and will work with your Microsoft account and the Azure active directory and other sites using the azure active directory.